Stems & Skins comes from former Husk sommelier Matt Tunstall and former Bull Street Gourmet owner Justin Croxall. Both partners have a passion for interesting wines and hospitality. The Park Circle bar is winning over wine nerds with esoteric labels and superb service. For the non-oenophiles, the food menu offers cheese, charcuterie, Mediterranean-inspired snacks, and sandwiches. Butter Tapas, formerly Butter Cupcakes, wants to bring “fine dining flavors and ambiance North Charleston.” Butter Tapas offers cheese plates, sweet potato grits, garlic crabs, truffle lobster macaroni and cheese, and tuna sashimi, among other sharable items. The restaurant opened earlier this year, but is starting to see traction after widely-followed chef BJ Dennis shared photos of the eatery’s creations on social media, spreading the word to a larger Charleston audience. After a review from Charleston Scene and a listing in City Paper, North Charleston addition Caribbean Delight is suddenly on everyone’s radar. Opened in January, the restaurant brings traditional Jamaican fare to Rivers Avenue. The menu contains national Jamaican dish ackee and saltfish, daily specials from curried goat to stew pork to oxtails, and customary sides like festival (fried cornmeal dumplings), bammy (cassava flatbread), roasted breadfruit, and more. Chef Adam Randall worked for several years to bring a traditional chippy to the Lowcountry. Randall wanted to introduce “proper” fish and chips to Charleston and reports that the shop has been selling out since unlocking the doors. Butcher & Bee is back with a bigger space, more parking, more hours, and a cocktail/beer/wine program. It’s everything you loved about the King Street location, but with more, including dinner service. Ever since pitmaster John Lewis came to town with his brand of Texas barbecue and knee-weakening brisket, people have hungered for his restaurant to open. With the doors to Lewis Barbecue unlocked, the crowds are free to indulge in beef ribs, pulled pork, brisket, and other meaty delights. Give the agua frescas a try too. Ever since opening, the downtown Home Team BBQ has packed in the crowds on a nightly basis. The Williman Street location lists many of the same cherished smoked meat items as the other HT barbecue outlets, but it also offers more cocktails, more elevated menu items, and more space. The interiors at Harold’s Cabin make the guests feel like they’ve stepped into a friend’s eclectic mountain home — a friend who happens to cook thoughtful, vegetable-driven dishes. A popular place for Wagener Terrace families, Harold’s Cabin serves savory grits, giant, fluffy biscuits full of interesting additions, and a produce forage board worth 100 Instagrams (we counted). There’s also confirmed reports of Bill Murray sightings (he’s an investor). 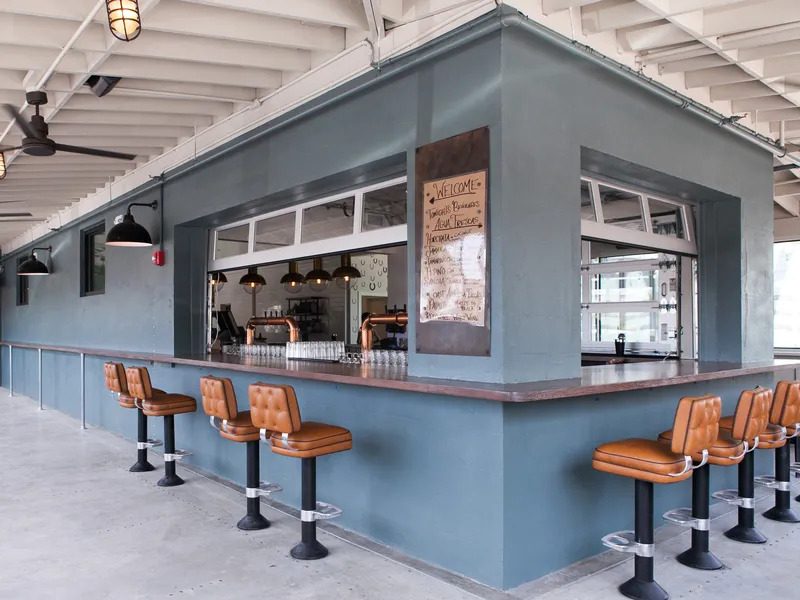 Spring Street newcomer Eclectic Cafe & Vinyl serves coffee, wine, craft beer, and light fare in a hip setting that also happens to sell music. If you haven’t been to Little Jack’s Tavern yet, then you’ve probably at least seen one of the hundreds of photos of the throwback booths on your social media feeds. From restaurateurs Tim Mink and Brooks Reitz, this new addition to North Central was poised to be a hit before it even opened. Old-school interiors combined with classic, comfortable fare, and half-price martinis during lunch make for a win. Everyone’s saying to try the burger. Former Eastside club Touch of Class transformed into The Commodore this past April, and folks are lining up to see what’s inside. Lounge seating, leather banquettes, and a small bar area with a jukebox surround the stage. The live music, the promise of dancing, and reasonable drink prices are the big draw for this newcomer. While Luke’s Craft Pizza only offers carry-out pizza, patrons are racing to get to the Ashely Avenue eatery to guarantee they’ll get a few of the artisanal pies to bring home. Chef Luke Davis, formerly of EVO, sources the best ingredients and works with seasonal produce to offer unique creations to guests. A recent special placed peaches, speck, and housemade pickled jalapeños on a pie. Crooked Crown recently opened on Spring Street with a perfectly simple summer menu — boozy popsicles and tamales, what else do you need? The team from King of Pops infuses mezcal, tequila, and gin with appropriate flavors to create an adult version of the melty treat. There’s also cocktails, wine, beer, and hooch-free versions of the popular pops. Seafood house The Darling Oyster Bar pulls in King Street visitors in with stunning interiors designed by Smith Hanes Studio. The menu from restaurant advisor Nathan Thurston and chef Joe DiMaio ranges from fried seafood plates to local oysters to shellfish pot pie. The raw bar facing the front window may become the most coveted seat on the block. The Darling also recently added brunch for additional hours to sample the fare. Currently, Feathertop offers brunch and dinner in an airy space with mid-century modern touches and plenty of light. The menu celebrates Lowcountry produce with many vegetable-heavy dishes and homemade pastas — for example, one of the seasonal starters is heirloom tomatoes with ricotta, basil, and lavender granola. Bottles of wine are all under $65 and dishes are $20 and under. Feathertop could be an easy date night option or a destination for brunch with friends. Wise Buck Smoked Meats is the most casual of the Damon Wise/Jonathan Buckley empire mounting on Ann Street. The eatery offers top-notch cookout foods like St. Louis ribs, deviled ham, leg of lamb sandwiches, smoked corn on the cob, and more. Grab some meat, a can of beer, and watch the crowds go by from a picnic table on the patio. Henrietta’s sits on the first floor of The Dewberry, on the corner of Meeting and Henrietta Streets. The space opens into a bar area with booths near the windows facing Marion Square. The concept for Henrietta’s takes cues from contemporary French brasseries. The menu is inspired by classical French cooking, but with a lighter, more vegetable driven touch. Seasonal, local ingredients, in-house butchering, and a wood-fire grill also shape the menu. The Living Room takes place of the traditional hotel lobby at The Dewberry. The mid-century modern space serves coffee, tea, cocktails from bar manager Ryan Casey, and free wifi. Boutique hotel Restoration recently hosted a grand opening party and showcased newcomer The Watch Rooftop Kitchen & Spirits. Word spread of the spectacular sunset views from the seventh floor restaurant — the windows and decks give guests a panoramic sweep of the entire downtown. Chef Chad Anderson’s menu reflects Lowcountry products, new Southern flavors, and a cosmopolitan feeling. Entrees read like a relaxed neighborhood restaurant with shrimp and grits, a half chicken, a seasonal vegetable salad, and a pimento burger with truffle fries. After a winning reviews from Charleston Scene and City Paper, the interest in Mexican/Italian restaurant Congress is heating up. Stop by for delicate ceviches, hearty Texas-style chili, homemade mozzarella, and chili rellenos.